When it comes to understanding Scandinavian cuisine, I’ve had to take a few steps back from my own experience and look at how the dishes and desserts I grew up eating fit within the culinary traditions of a people and a place. Sometimes just being in the midst of it–especially in one’s youth–provides the enjoyment of the moment without the appreciation or understanding of perspective. Such was my experience with the holiday meals my dad’s parents served on Thanksgiving and Christmas when I was growing up. The pork roast, medisterkaker, surkål, steamed vegetables, and rice cream were standard fare at their house, and on one hand I knew that we were eating a Norwegian spread. But on the other hand, it took a trip to Norway as an adult, along with an active exploration of the foods of my heritage, for me to fully grasp the gift I had been given by experiencing those home-cooked meals year after year. Since starting Outside Oslo several years ago, I’ve enjoyed having an outlet for sharing my explorations of Scandinavian cuisine and an excuse to get to know more fully what defines the foods of the Nordic countries. As I seek to build culinary traditions in my own home that reflect my family’s heritage, I love that I get to collect those notes and ideas and recipes here–and that you share your feedback and your own experiences as well! The other day I built a meal around a commonly-used ingredient: dill. Danish food writer Camilla Plum, in her book The Scandinavian Kitchen, calls dill “the ultimate Nordic herb,” and I agree. In the early days of my Scandinavian culinary exploration, dill was one of the flavors that seemed to most represent the cuisine. It flavors everything from gravlax to cucumber salads with its grassy, springlike taste. As I explored dill in Scandinavian cooking the other night, the main course was cod served with a creamy dill sauce–a traditional way of serving fish. For the accompaniments, I branched out and allowed the flavor to be my guide as I shopped for vegetables, choosing bright red tomatoes and alluring green beans to bring home. A tomato salad came together easily, with a simple dressing of olive oil and red wine vinegar to accent the flavors of the tomato and dill. Thinking of what flavors would best suit a dill vinaigrette for green beans and mushrooms, I combined white wine vinegar and Dijon mustard, whisking in walnut oil to give it a soft, nutty profile that would pull all the flavors together. I have included all three recipes here, two of them Outside Oslo originals. What are your favorite ways to work dill into your cooking? Please share–I’d love to hear from you! Serve this sauce–adapted from Scandinavian Classics by Niklas Ekstedt–with cod prepared in any way you’d like; broiling is an easy way. 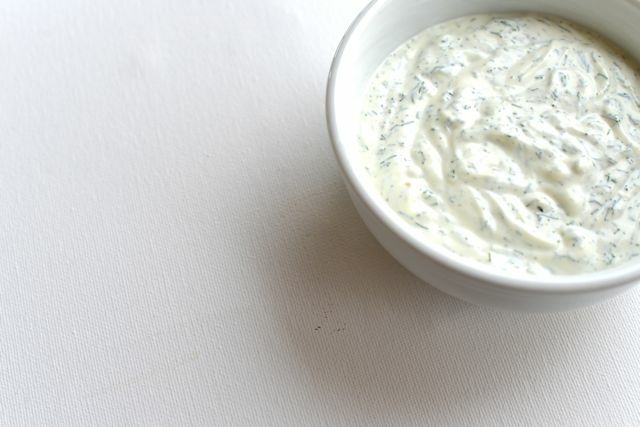 Mix mayonnaise, sour cream, dill, and a pinch each of salt, pepper, and sugar in a bowl until smooth. Taste and adjust seasonings as needed. Chill in the refrigerator for at least 30 minutes to allow the flavors to meld and the salt and sugar to dissolve into the cream. Steam green beans until tender. Meanwhile, heat olive oil in a large skillet, then add mushrooms and sauté until cooked but still al dente; season with a little bit of salt. 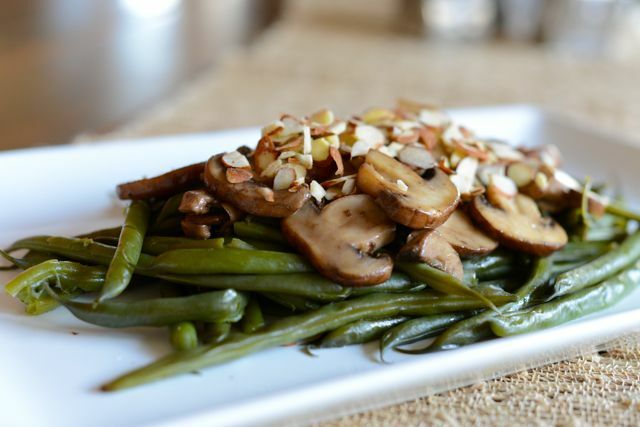 Arrange green beans on a platter, and top with mushrooms. Scatter sliced almonds over the vegetables, and drizzle the vinaigrette on top. Stir together vinegar and salt in a small bowl, then slowly add olive oil, whisking constantly until emulsified. 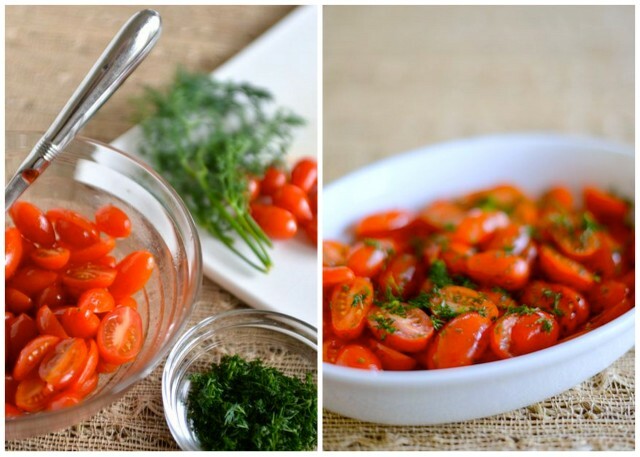 Toss vinaigrette with the tomatoes until coated, then arrange in a shallow serving dish. Sprinkle chopped dill over tomatoes and serve. Ah, dill! I just love the stuff! The plant looks so attractive, the leaves so pretty, and the flavour is fantastic. I love it on potatoes, and it is sensational in an all-herb salad. So fresh and aromatic! Nice idea to combine with the green beans. It’s one of those almost-whimsical herbs, isn’t it? The fronds are delicate and flutter in the wind, yet the herb packs such a bright flavor! In the Green Bean and Mushrooms recipe, where is the walnut oil used? Sandra, the walnut oil should be used in the vinaigrette; I mistakenly mentioned olive oil in the directions there and just updated the recipe. My apologies. Thanks for pointing it out! Sorry, I realize that it was a typo in the recipe. In the article, it’s stated that the walnut oil is in the vinaigrette.